The final bag of coffee that I bought on my July 2018 trip to the United Kingdom was this bag of Square Mile Coffee Roasters’ Red Brick Espresso Blend. I picked this up in York, at Spring Espresso. I don’t usually drink milk drinks, and I really don’t usually buy a coffee drink made with the same beans I am buying. But in this case, I asked for a cappuccino made with these exact beans so that I could get an idea of how a cap tastes when made by someone who was used to working with the blend. What I got was perhaps the most comforting and soothing cup of coffee that I had tasted on my entire trip. It tasted like a hug, full of affection and warmth and love. I nearly cried. Side note: I sometimes have friends say they’re afraid to make coffee for me. It breaks my heart a little to hear this. Of course I can make my own coffee, but it’s such a gift to have someone else make something just for you, especially when it’s made with love. Ever notice how sandwiches always taste better when someone else makes them, even if you can assemble the exact same sandwich yourself with the same ingredients? We can taste thoughtfulness. I’m not saying the barista who made my cappuccino that day loved me, but I am firmly convinced that she wanted me to enjoy the drink and for my day to be better because I stopped into her cafe. She succeeded on both counts. So, bake for your baker friends! Cook for your friends that are great cooks. Let them feel cared for once in a while – it will be appreciated. Whole bean: I apparently forgot to write anything down here, which tells me these medium-roast beans were probably sort of nondescript smelling. Nothing stood out particularly in this blend other than smelling pleasant. Espresso: I liked lower temperatures for this blend because it brought out a creamy vanilla and orange flavor; temperatures 203 F and up started to bring out a pithy, slightly bitter flavor. Favorite parameters for this blend: 200 degrees F, 18 grams in, 35 grams out, 30 second pour. 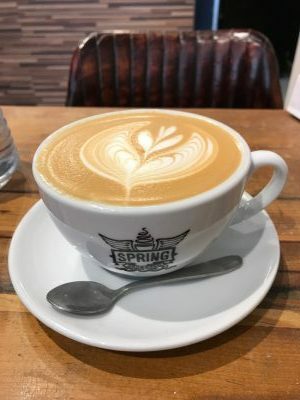 With milk: Again, I don’t normally drink milk drinks so I didn’t experiment with it at home, but that cappuccino I had at Spring Espresso will linger in my memory for a long, long time. Highly recommended. AeroPress: I actually think I liked these beans better in the AeroPress vs. pulled as true espresso. This had a really beautiful balance of toasty flavor with vanilla and mild orange. I enjoyed this thoroughly. Summary: Good straight, very nice in milk, and excellent brewed in an AeroPress. It’d be hard to go wrong with this espresso; between this and their Ethiopia Mormora, I’m kind of in love with Square Mile and I do hope to get to try more of their offerings in the future. Note: the blend changes seasonally so the current version of this blend could be markedly different. Review conducted 14-16 days post-roast.